This was another dish I made for a recent dinner party. 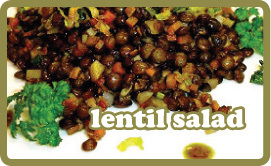 It’s a simple and tasty way to eat lentils. I’d never had anything like this, but was very surprised just how moreish they were. I kept them near my plate the entire meal. Peel the onion, leaving the root intact. With a knife make a small “X” shape. Insert a clove into the centre. Repeat with the second clove. PLace in saucepan together with the lentils, lemon rind, garlic, bay leaf, cumin and 875ml (3 1/2 cups) water. Bring to the boil and simmer gently for 25-30 minutes until the lentils are tender but not mushy. Drain the lentils in a seive or collander and pick out the garlic and reserve. Pick out the onion, bay leaf and lemon rind and discard. Leave the lentils to cool for 15 minutes. Mash the garlic with the back of a spoon and add to a large bowl and whisk together with the vinegar, oil and lemon juice. Add the lentils, spring onions, mint salt and pepper and stir well. Cover and leave for 30 minutes to allow the flavours to develop. Great with fish, but even better with eggplant salad and some flat breads.